Fall is tantalizingly close, and today hundreds if not thousands of women ages 18-39 will wake up this morning, put on a pair of leggings, grab a grande Pumpkin Spice Latte, and waste the day away in bed beginning their Gilmore Girl binge on Netflix. Now, while I may own the entire series on DVD as well as having the entire series loaded onto my Roku for ultimate sloth mode watching in my bedroom, excitement still brims forth for the long awaited release today on Netflix. Ever since the announcement of the Netflix release I've seen countless articles online about my favorite show of all time. I must say, most of them are pretty lame. As someone who has watched the show since it aired, and since then have watched it in it's entirety at LEAST 30 times, I can say I am a bit of an expert. So when I see lists like the one here, I can't help but roll my eyes and let the sarcastic quips fly. So for anyone who cares what this self-appointed Gilmore Girl expert has picked as her favorite episode for each main character you can read below. If you haven't watched the Gilmore Girls and you don't some minor story lines ruined do not read below. 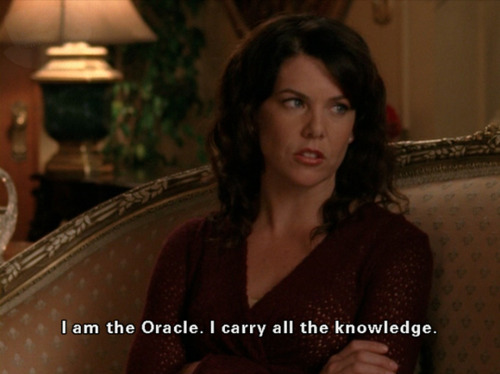 "Ted Koppel's Big Night Out"
Choosing my favorite episode for Lorelai was basically impossible. One of the best things about how her character was written was that there was always so much to follow; never a dull story line. Her roller coaster relationship with her mother, her journey of opening her own Inn, and her relationships with many worthy suitors. I finally chose one of my favorite episodes where she attends the Harvard/Yale game. After being pursued by Jason Stiles, but refraining on accepting so as to keep the peace with her mother, an argument erupts from a very irrational misdirected reaction by Emily and causes Lorelai to call her persistent admirer for a night out at a hip and exclusive restaurant. After seeing Ted Koppel at the bar at this chic restaurant they are whisked away to a private room which makes Loreali uncomfortable. To some who watch this, they may think she is being spoiled or rude, but I love this because it's totally something I would do. I love that her character speaks her mind and isn't afraid to voice her feelings even during the critical moments of a first date. When Jason later asks her "does everything with you have to be fun" she replies "yes, when I'm on a date". Ultimately, I love that they end up at a grocery store buying Pringles and Snowballs and end up having a great first date. What more could a girl ask for? Except, maybe Ted Koppel buying some toothpaste next to them. Watching Lane’s constant struggle between being true to her independent spirit while still loving and respecting her mother is something I think we can all identify with. Lane feels the need to make a strong rebellious statement that she’s going to play drums in a rock band while dating a non-Korean boy and what better way than to dye her hair an outrageous color. As she and Rory enter Stars Hallow’s only beauty store they try and find the perfect color to suit her rebellion while steering clear of all the cheese that is associated with the color pink (Gwen Stefani and the singer Pink). They decide on purple and we watch Rory and Lane have one of their perfect bff bonding moments while burning her freshly dyed scalp. Once her hair is finished she basks in her new found coolness for only a moment until she realizes she can’t possibly let her mother see what she has done. I love this episode because for all the moxie Lane had, she always cared about her mother and disappointing her. She was the poster child for the constant adolescent struggle to find balance between obedience and happiness. "Luke can see her face"
The Vulture.com list calls out the best Luke episode as the one when he takes his first real step to be more than a friend to Lorelei by taking her to his sister’s wedding. Sure it's pretty heart melting when you see them dancing and waltzing (Luke can Waltz). While I agree it's a great episode, what precedes it is where you really love Luke like you never have before. Finally realizing that perhaps something could be done about his single status and his failed relationships he does what most men wouldn't do and tries to sneakily buy some self-help books and tapes from Andrew’s book store. He asks if the name of the book will show up when it is scanned and hands Andrew $100 and leaves. He mocks as he listens to the author, until multiple questions are asked with the follow-up “Can you see her face”. To watch his expression go from cynicism to "mind blown" is like 40 Luke and Lorelai waltzing scenes. If only we could see the expression on our loved ones face when they realized we were the one. We spend so much of season 6 being fed up with Rory and her stubbornness that it is so refreshing when she finally gets the kick in the pants she needs to get back on track, even if it is from a surprising source. It’s comical and refreshing to finally see her go toe to toe with her grandmother, just as her mother had so many times before her. My favorite scenes may be when she plants herself at the Stanford Eagle Gazette with no plans of leaving until she is offered the job that should have been given to her by her nemesis Mitchum. Sure it would have been great if Mitchum's words hadn't crushed her in the first place and led her down a confused path, but who of us wouldn't or haven't reacted the same way when we were young and told by a professional bully that we just didn't "have it". It's one thing to hit a road bump in life, but there is true character shown when you can pick yourself back up and take the necessary risks you need to get you back where you need to be. I love so much about Sookie, so it’s really hard to choose one episode for her, but I can’t help but identify with her realization that she doesn’t like kids while she is pregnant. While I’ve never been pregnant, I can easily visualize myself with child, surrounded by them at a Lord of the Rings party and wondering why the little monsters don’t want to eat green Macaroni & Cheese with jalapeno chipolte cream sauce. After yelling at a little girl and seeing how Loreali rights her wrong, she goes into a panic pointing to her belly saying "get it out, get it out, get it out". She mentions how at family gatherings when her neice sings Mariah Carey songs she heckles. I laugh because I often feel like I am missing the mom gene that coos and awes at babies and would most likely have my own Sookie meltdown if I were ever to get knocked up. I can only hope I have a best friend by my side to calm me down like Loreali did. You love her and hate her and feel bad for her simultaneously, but never so much as you do in “Scenes in a mall”. Fed up with the feeling that she has been made obsolete by her husband’s young and hip new business partner Emily runs into Rory and Lorelai at the mall and takes drags them through a shopping spree where she she buys more than we could purchase in a lifetime with one rage induced stroll down the aisles. My favorite part may be when she points to a globe and asks the clerk how much it costs, and when he tells her it’s not for sale, she quickly and sharply retorts only as a wealthy white women could “Everything's’ for sale”. Once the girls get her to leave stunned onlookers behind they take her to the only place that they can afford to spend money in the mall, the Food Court. She seems completely confused by what part of the mall they are, and is off put by the plastic tables and chairs. She softens throughout their meal, even enjoying her first Orange Julius. We sympathize with her because we've all experienced the feeling of being worthless or simply not needed and we pour our sorrows into a plastic table full of unhealthy food. We just don't do it while buying glass apples from Venice. "Not as cute as Pushkin"
Paris is another one of the complex characters you hate and then love but still are constantly annoyed by. Although I can't help but love her brash way of dealing with people, mostly because it's not directed toward me. Following the death of her beau, Paris listens to her life coach and puts herself out there by attending a speed dating class. What ensues is why I love Paris. Brains over beauty errrrrday. So enjoy your binge my friends, and if you read this list shaking your head at my pathetic life filled with obscure pop culture references devotion to the Gilmore Family, I leave you with this.